Transform your skincare routine with the Precleanse Balm and UltraCalming Cleanser Duo from Dermalogica. Combining nourishing natural ingredients with effective formulas, skin will be left thoroughly clean, clear and hydrated. Refresh and revive your complexion with a balm-to-oil formula that expertly dissolves dirt and impurities without over-drying or uncomfortable tightness. Powered by Apricot Kernel Oil and a Natural Biolipid Complex, the innovative cleanser transforms into a milky emulsion upon contact with water to diminish waterproof makeup, excess sebum and environmental pollutants, while protecting the skin's moisture balance and barrier function. 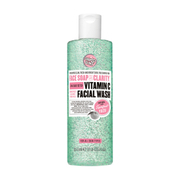 An extremely gentle cleanser that heals and protects the face and eyes against environmental stressors such as pollution, UV radiation or irritating cosmetic allergies. The makeup remover contains Lavender, Echinacea and Raspberry Extracts for their anti-inflammatory benefits, as well as the exclusive UltraCalming Complex for its soothing properties. Formulated for even the most hypersensitive skin, the cleanser leaves no irritating residue and will ensure skin is kept cool and calm. The soft-touch, easy-to-use cleansing mitt features a double-sided design with smaller, shorter bristles and larger, thicker nodules for a gentle yet effective cleansing experience. 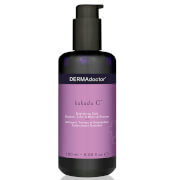 Expect a cleansed, revitalized complexion with restored radiance and a healthy-looking glow. Precleanse: Squeeze tube to dispense product onto cleansing mitt or directly to dry palm of hand. Massage product into dry skin using circular motions. Add water to emulsify. Rinse and follow with recommended Dermalogica Cleanser to complete the Dermalogica Double Cleanse. Store at room temperature. Ultracalming Cleanser: Following the application of PreCleanse, apply to the face and throat, gently massaging with fingertips with light, upward strokes. Rinse thoroughly with warm water or remove with dry cotton pads. Precleanse: Caprylic/Capric Triglyceride, C12-15 Alkyl Benzoate, Laureth-4, Hydrogenated Vegetable Oil, Ozokerite, Bis-Stearyl Dimethicone, Glyceryl Behenate, Tribehenin, Stearyl Stearate, Stearic Acid, Phospholipids, Prunus Armeniaca (Apricot) Kernel Oil, Glycine Soja (Soybean) Oil, Lavandula Angustifolia (Lavender) Oil, Citrus Aurantium Dulcis (Orange) Oil, Citrus Grandis (Grapefruit) Peel Oil, Citrus Nobilis (Mandarin Orange) Peel Oil, Cymbopogon Schoenanthus Oil, Lavandula Hybrida Oil, Glycol Distearate, Sorbitol/Sebacic Acid Copolymer Behenate, Tocopherol, Glycolipids, Eucalyptus Staigeriana Branch/Leaf Oil, Glycine Soja (Soybean) Sterols, Linalool, Citral, Limonene, Phenoxyethanol. 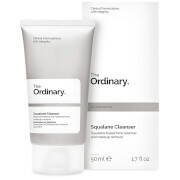 Ultracalming Cleanser: Water/Aqua/Eau, Cetearyl Alcohol, Bisabolol, Zingiber Officinale (Ginger) Root Extract, Leuconostoc/Radish Root Ferment Filtrate, Glycerin, Avena Sativa (Oat) Kernel Extract, Cucumis Sativus (Cucumber) Fruit Extract, Rubus Idaeus (Raspberry) Fruit Extract, Lavandula Angustifolia (Lavender) Flower Extract, Salix Alba Bark Extract, Usnea Barbata (Lichen) Extract, Butylene Glycol , Pentylene Glycol , Hydroxyphenyl , ropamidobenzoic Acid, Citrus Medica Limonum (Lemon) Fruit Extract, Fumaria Officinalis Flower/Leaf/Stem Extract, Fumaric Acid, Echinacea Purpurea Extract, Panthenol, Acrylates/ C10-30 Alkyl Acrylate, rosspolymer, Cocamidopropyl PG-Dimonium Chloride Phosphate, Disodium Lauryl Sulfosuccinate, Cetrimonium Chloride, Aminomethyl Propanol, Glyceryl Caprylate, Disodium EDTA.